A gorgeous and sparkling large emerald cut diamond 18ct white gold full eternity ring. This bespoke piece was made for one particularly special and loyal customer, and now mother to a apprentice goldsmith at Nicholas Wylde! 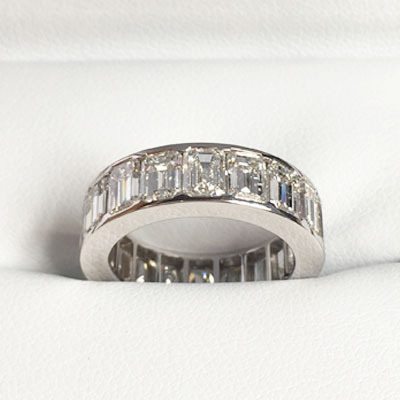 The 18 striking diamonds are channel set around the full band and have an approximate full weight of 6.20ct.